Visit to Penrith (Australia) Printing Museum, reopened after an eighteen month closure for extension work. Guest post from Jürgen Wegner, editor of The shadowland newsletter, Eastwood, New South Wales, Australia. First published in The shadowland newsletter, n° 85, May 2018. 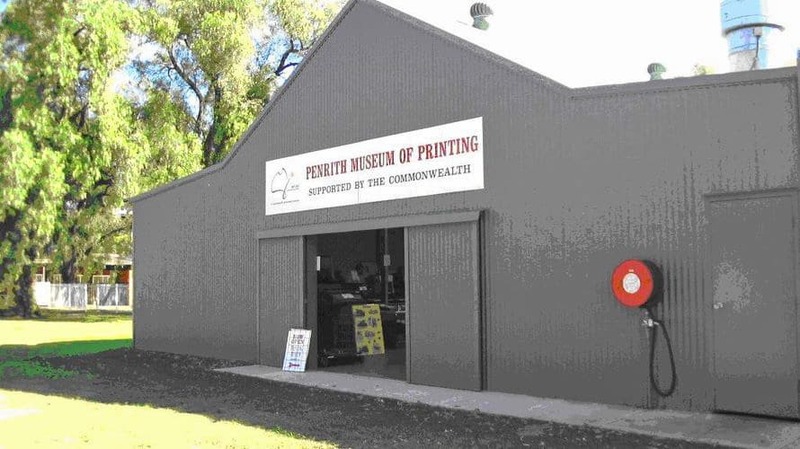 The Penrith Museum of Printing — Penrith is a large suburb in the far west of Sydney, at the foot of the Blue Mountains — has only just re-opened after a closure of about eighteen months. We’re in the age of oversizing and the museum, too, was feeling a bit tight at the waistline — it is always so frustrating when printing museums have to turn away good printing machinery and equipment. And so, a large part of its capital reserves was spent on extending the premises and renovations. Closures are always challenging. Is anyone surprised that the builders didn’t keep to expected schedules? A greater challenge is to get things back moving again. If you are closed for any length of time, projects and servi-ces have to be discontinued (tours and workshops). People stop coming and you are out of sight, out of mind. As the saying goes. The museum was established in 2001 by Alan Connell as a project to keep some of the local printing history alive. Many of Australia’s printing museums are based on the local newspaper as so much of Australian pioneer printing history is the history of the spread of communities and their thirst for news. From ‘Home’ but also often as an outlet for more than just information. Local newspaper printing shops often also printed the first regional fiction in prose and poetry. 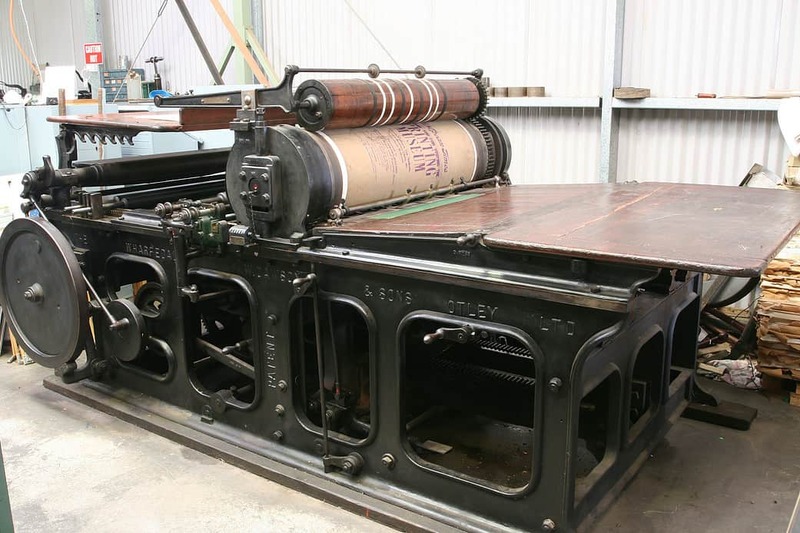 The Penrith Museum of Printing has at its core much of the machinery and equipment from the old Nepean times newspaper, the Nepean being the river which separates Penrith from the mountains. The idea behind the museum is to show as a working collection what a Forties printery would have looked like. It is in the nature of such things that these projects are undertaken not at the tide’s peak but after the tide has largely gone out. Most of the volunteers and helpers at printing museums are older persons, often retired from the trade. And so, longevity in office is something that’s often limited. Although, to be fair, retired printers do seem to live to a venerable old age. Someone in their seventies is a young chap and to be volunteering and working into your nineties is not unheard of. Connell died some years ago and, subsequently, the management of the museum has been in the hands of the youthful (in his fifties!) President, Stephen Brique. It is not always easy to get people to visit museums. Been there, done that. How many times can you really go and look at printing presses—even ones that are working. A recent blow has been the death of the Linotype operator and so there will now be a gap in the demonstrations. (Applications encouraged)! And so, you need to be constantly putting on events to give people a reason to detour or to spend their precious Saturday afternoons at the museum, when they could be sitting on the couch at home, eating pizza and watching football. One of the regular events on the calendar at the Penrith Museum of Printing is their six-weekly series of talks and discussions called the Meet-up ‘cogitamus’. The idea is to present every so often ‘a forum for people interested in graphic art, letters, books and design’. The first of these was presented on Saturday, 21st April, 2018, by Dr Stephanus Peters who talked on Chinese history: early development of printing in China and Asia. Peters has a Ph.D. in Chinese philosophy but has spent a nomadic life largely working for the UN. He has also lived and worked in China. These talks are short and are preceded by a general introduction of those attending and discussion. But I was interested to be shown illustrations of a set of Chinese type cases. Not those of European design and manufacture such as the Chinesischer Zirkel (Ger., Chinese Reading Circle) — there are five including one at the Gutenberg Museum. But an actual set of Chinese round wooden type cabinets as used by Chinese hand compositors. A visit to the museum usually includes a demonstration of typesetting and printing — it is a working museum and all of the presses and equipment is in working order — though it may take a little while for everything to be up and running again. Especially their pride and joy, a huge Wharfedale cylinder press (1880s). They also have two Albions amongst the museum’s twenty-four operational items plus a Model 5 Linotype (1905) and a Model 8 (1922). There is also an Intertype and many other, smaller, but perhaps even more interesting items. After all, who does not have a Linotype or an Albion. But they have a very neat little German, Leipzig, Kahle bench-top platen and, also spotted, something new? What looks to be a paper folder of a size that could be used to fold small printed newssheets. Like so many of these museums, not enough use is made of the opportunities of the Internet. So few — almost none — of these museums have a detailed inventory online. As part of their recent acquisitions, a set of bookcases was purchased and their library of over four hundred books is now neatly housed. (Something on my long shortlist for later). One of the volunteers is in the process of cataloguing this material online with almost three hundred items catalogued (if catalogued means the online listing — see below for a link). There are many online ‘catalogues’ out there and the first thought that springs to mind is: Does no-one think to go to their local public library and have a look to see what an actual catalogue record looks like?! Which makes me wish I had a little more by way of spare time. There is also talk of starting up a newsletter — hopefully this will be regular and available online. The next Meet-up ‘cogitamus’ is planned for Saturday, 2nd June, 2018, at 14.30, when it is anticipated that James Cryer will present a talk on Australian printing history. Penrith Museum of Printing, Annual report, 2017/18, p. 7.